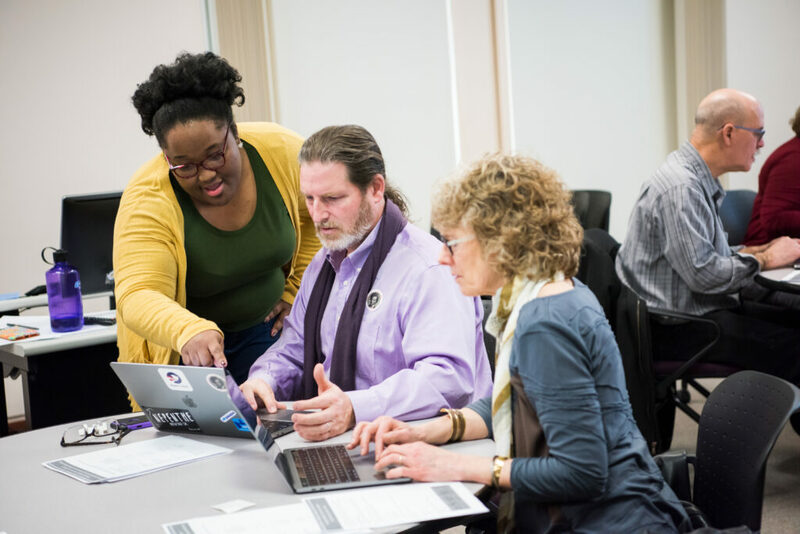 The UMBC Dresher Center for the Humanities will host its second Humanities Teaching Lab (HT Lab) on Thursday, March 8, with a focus on how digital media tools can help boost access to and further equity in humanities education and research. The HT Labs theme “Digital Humanities and Difference in Research and Teaching” extends a conversation already underway in the vibrant humanities community convened through UMBC’s new Inclusion Imperative program, funded by the Andrew W. Mellon Foundation. Roopika Risam, assistant professor of English and secondary English education at Salem State University, will deliver the keynote address in the UMBC Dresher Center for the Humanities in the Performing Arts and Humanities Building from, 11:30 – 1 p.m. Risam, who wrote the book New Digital World: Postcolonial Digital Humanities in Theory, Practice, and Pedagogy, will discuss her new project Mapping W.E.B. DuBois. Joining her will be UMBC faculty panelists Anne Sarah Rubin, professor of history and associate director of the Imaging Research Center; Bryce Peake, assistant professor of media and communication studies; Tania Lizarazo, assistant professor of modern languages, linguistics, and intercultural communication; and Drew Holladay, assistant professor of English. Digital Humanities Teaching Lab: Frederick Douglass Day 2018. The expanded use of digital tools has enabled new, visionary kinds of humanities work in formats that would have been impossible ten or twenty years ago. It has also increased the visibility and accessibility of existing humanities research that pushes the boundaries on issues of race, community, equity, access, and agency. Risam, who focuses on what a postcolonial critique brings to the digital humanities, also sees the field as a major opportunity to reach new audiences and revisit questions humanities scholars have been asking for centuries with new tools like digital textual analysis, mapping, and data visualization. “For English majors, who are skilled at being incisive readers, communicating, writing effectively, making arguments, and evaluating evidence, it means having a new medium to critically apply existing skills,” she explains. This process has allowed Risam to examine in new ways W.E.B. Du Bois’s work and legacy across audiences and disciplines. At the same time, she wants to highlight the importance of not just reexamining historical texts through digital tools, but also taking contemporary texts seriously as objects of research. Panelist Drew Holladay agrees that today’s popular digital platforms are essential to working in the humanities. Holladay’s health research centers on communication, specifically the digital rhetoric of health and medicine, by focusing on the ways in which people with disabilities talk about themselves online compared to how health practitioners describe them. He views platforms like Facebook as not only relevant subjects of or platforms for research, but also as a gateway to connect students with current research on how social media impacts our use of language and how persuasion changes in digital spaces. Through the digital humanities, he notes, English composition moves beyond writing to include composing with video, podcasts, building websites, or utilizing databases—a broader range of forms of cultural expression and communication. For example, Holladay suggests, digital humanities opens avenues for us to examine the multitude of media and public conversations around the film Black Panther: a comic that has become a blockbuster movie, and has now led to new cultural production in many forms, from fan fiction to cosplay.